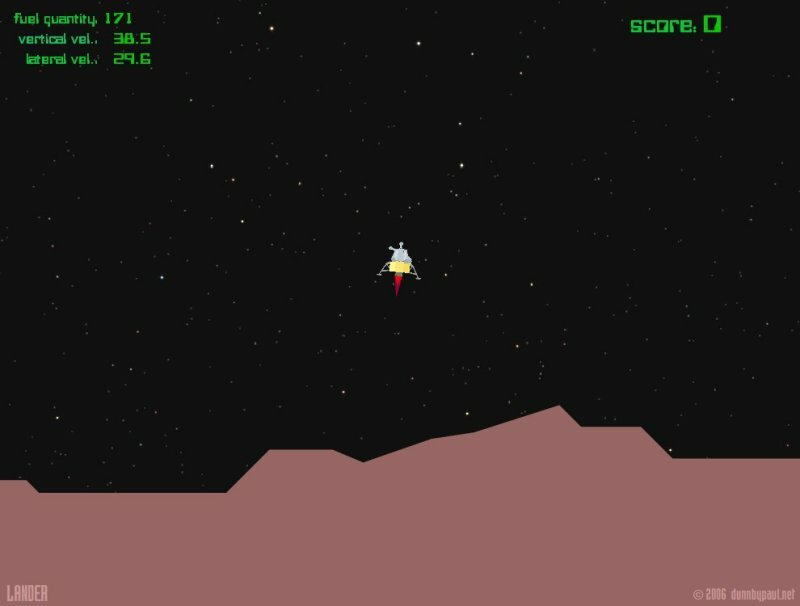 Lander is loosely based on and very much inspired by the 1979 Atari video game Lunar Lander. The goal in this version is to have as many successful missions as possible. Return to the moon in consecutive missions until your character suffers an accident or is marooned on the moon. To operate your vehicle, use the four cursor keys; left and right are used to rotate the vehicle and up operates the main thrusters (the down key also operates the main thrusters). Alternatively, use the keys A,S,D and W; A and D to rotate and S and W for thrusters. Good Luck and don't run out of fuel! You might need to click on the game once before the keys will work.